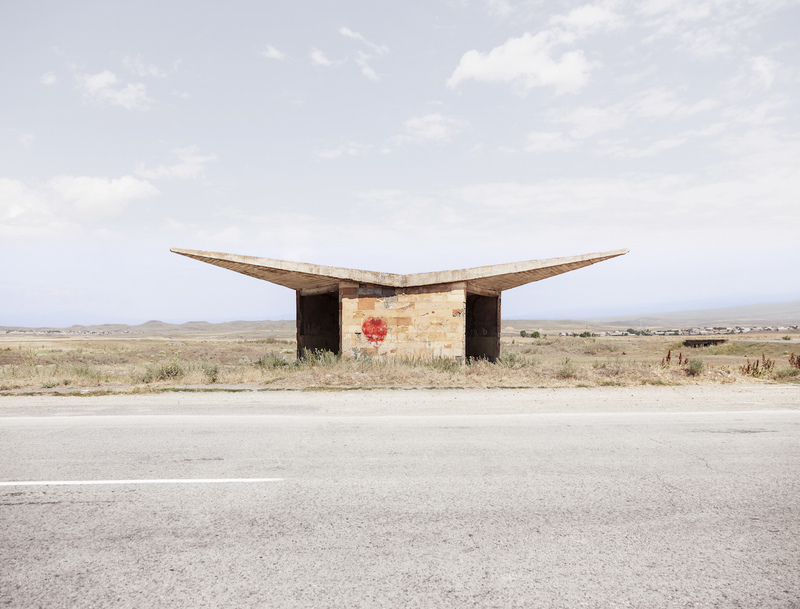 For over a decade, photographer Christopher Herwig travelled through 15 former Soviet countries on a scavenger hunt for one specific form of architecture: the common bus stop. 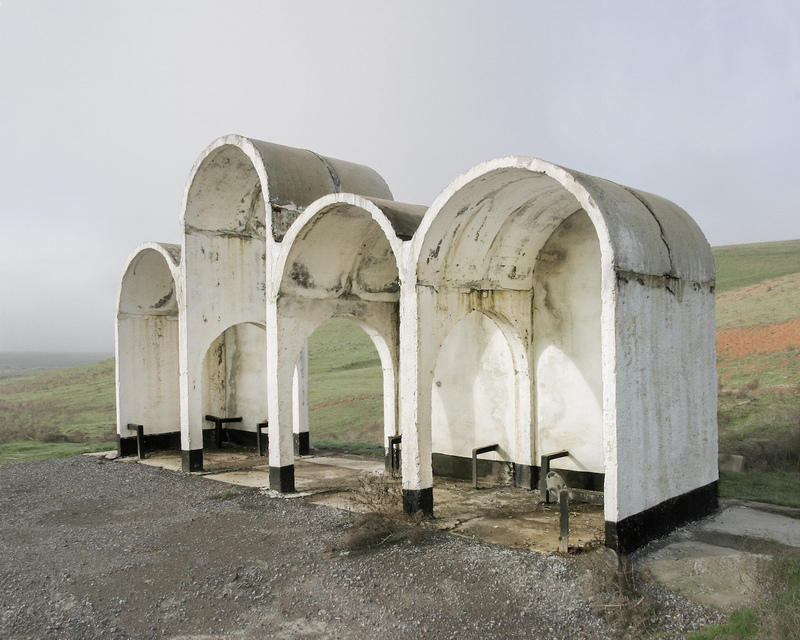 Although unremarkable in most cities, the waiting stations Herwig found and captured were far from quotidian, standing as unique sculptural works. 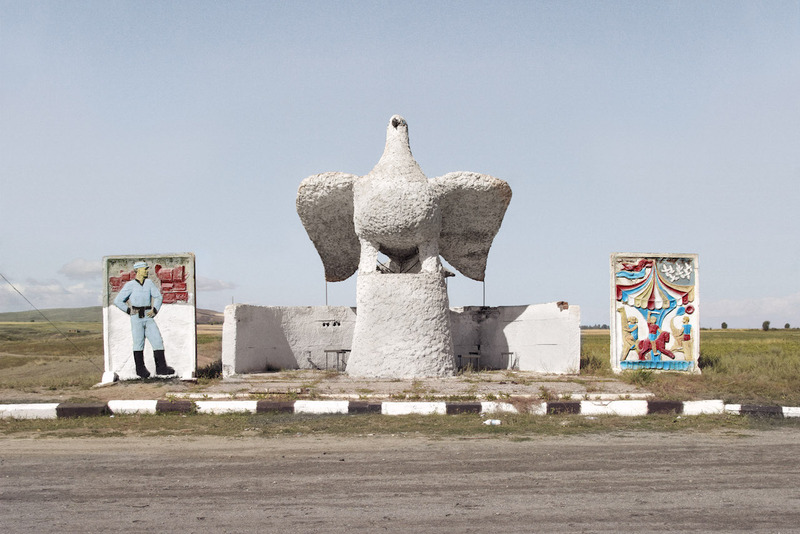 His forthcoming book Soviet Bus Stops compiles these images in a 192-page tome — an expanded version of the same, limited-edition title he released last year through Kickstarter. 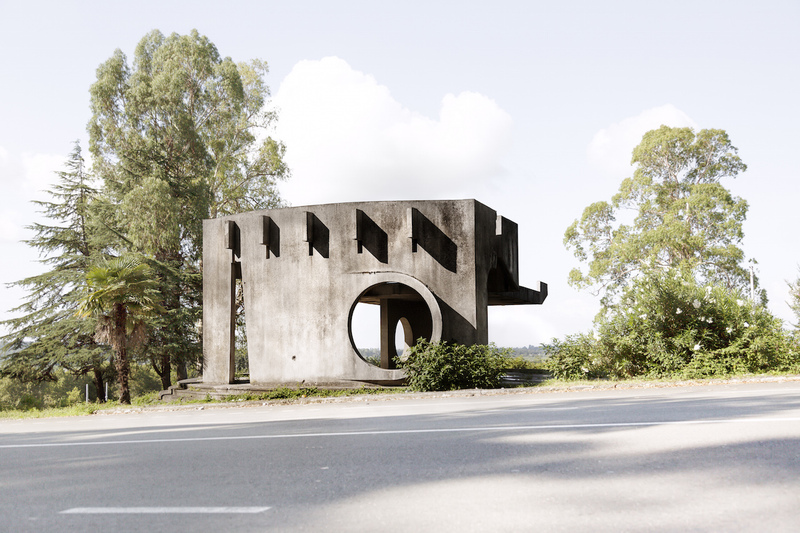 Designed by individual architects, each bus stop proffers a glimpse of the artistry that still flourished in an era when uniformity was imposed and creativity was often suppressed. The results are highly geometric, puncturing the often-barren surrounding landscapes with grandiose curves and exaggerated angles. 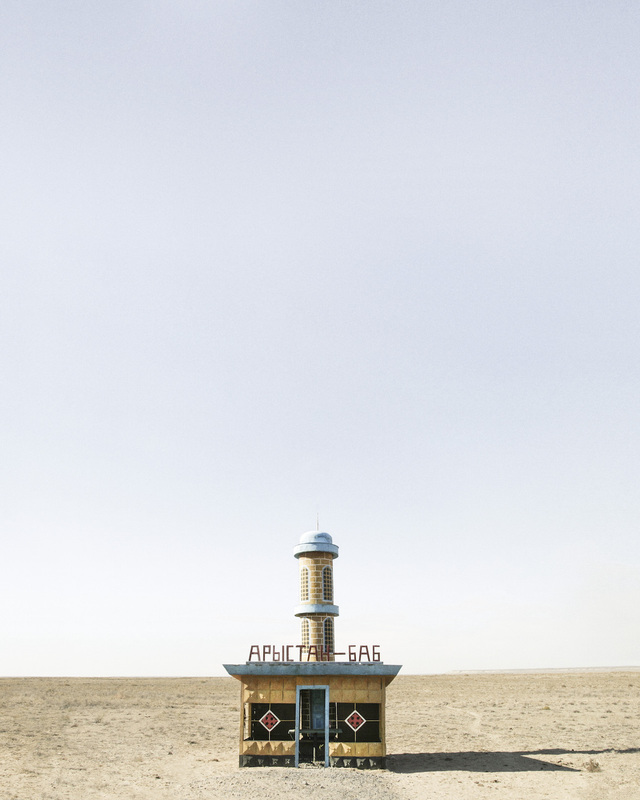 Many still retained at least some hint of their original vivid coloring when Herwig shot them, making them especially whimsical structures on shabby dirt roads. 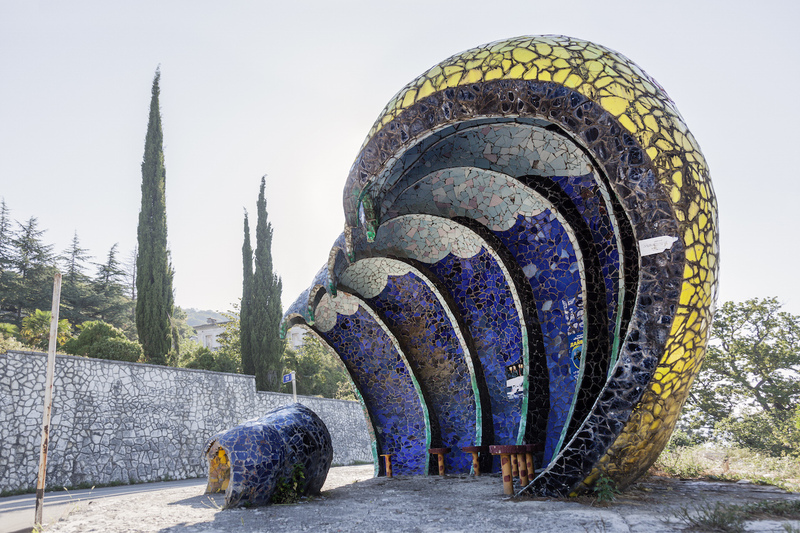 One bus stop in Gagra, in the disputed region of Abkhazia, rises gracefully from gray concrete like a wave to form a shelter composed of undulating layers, each covered in mosaics. Another in Uralsk, in northwestern Kazakhstan, resembles a single-room house, complete with a blue doorframe, large pane-less windows, and even a chimney-like shaft decorated with polka dots. 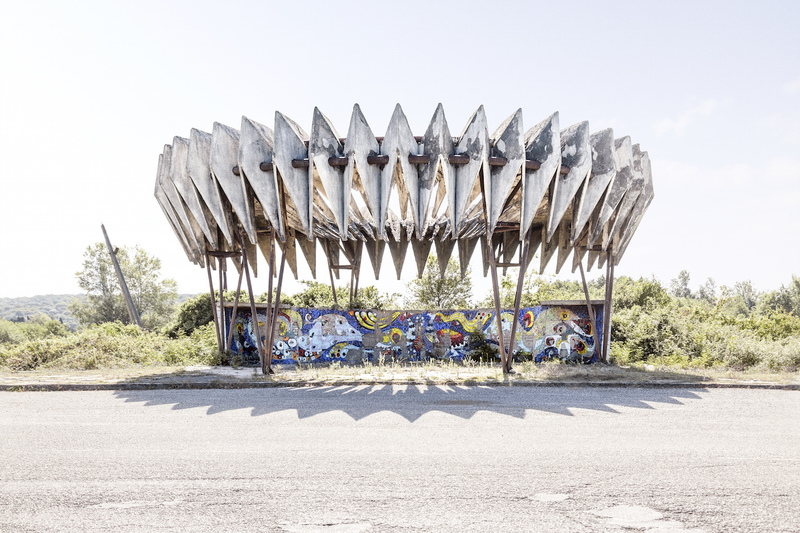 Some even cater more to style and less to function: a bus stop in Pitsunda, Abkhazia, doesn’t feature any benches but flaunts an intricate wall of mosaics and a striking, brutalist overhang that recalls the spines of a sea urchin. 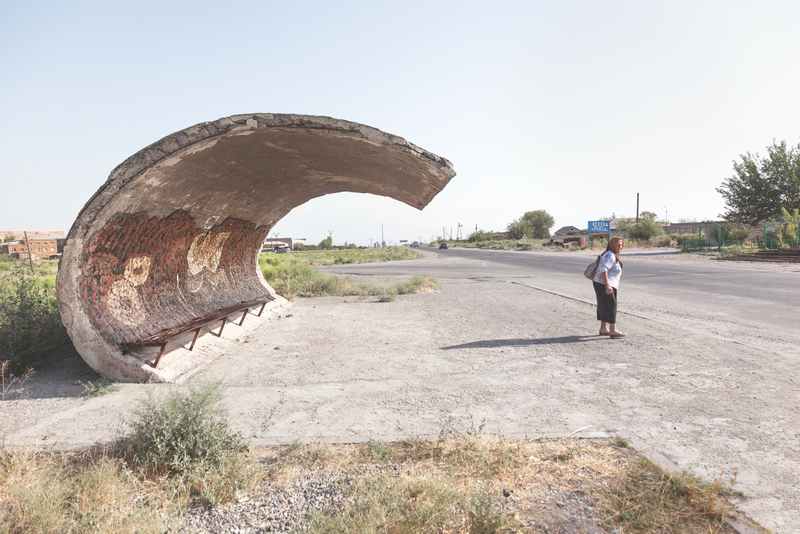 It offers commuters no shelter, either, like another one in Karakol, Kyrgyzstan, which is dominated by a sculpture of a plump bird. 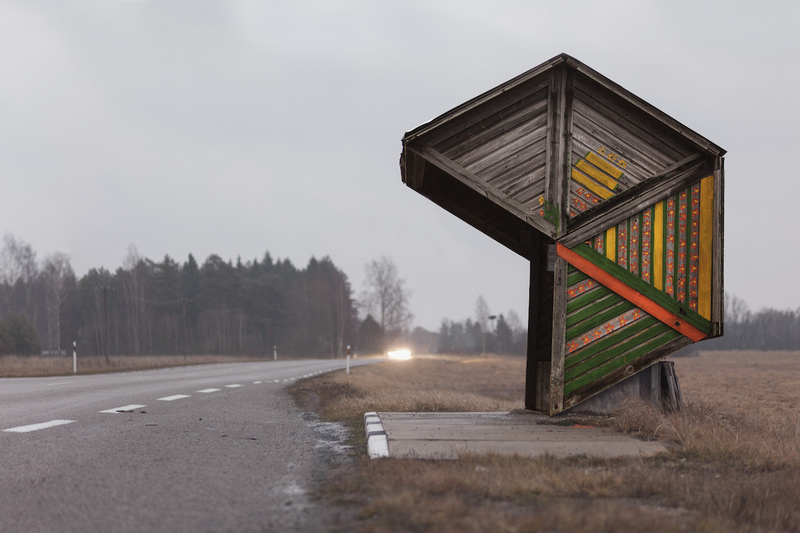 Herwig’s journey, which covered over 18,000 miles through countries including Armenia, Georgia, Estonia, and Latvia, began in 2002, when he noticed the creative bus stops on a bike ride from London to St. Petersburg. With his interest piqued, he began intentionally seeking out more, searching blogs for clues, speaking with bus drivers, and even roaming landscapes on Google Earth. 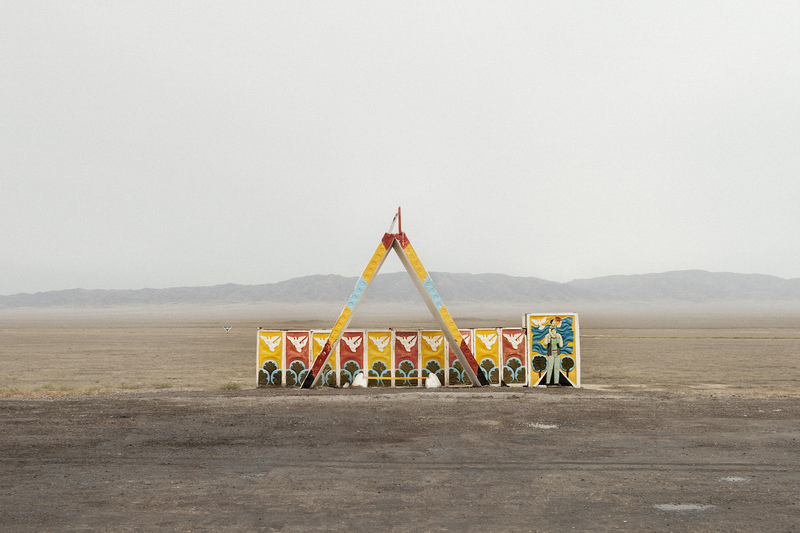 He even managed to track down some of the artists and architects behind these eye-catching structures and spoke with some, although these conversations are unfortunately not included in the book. 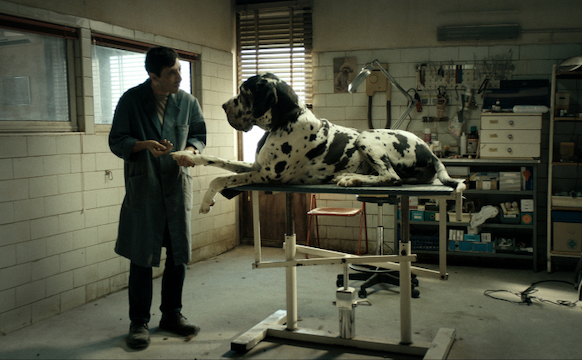 They include interviews with Zurab Tsereteli, a Georgian-Russian artist who is currently president of the Russian Academy of Arts, and Armen Sardarov, a Belarusian architect who has designed over 100 bus stops. 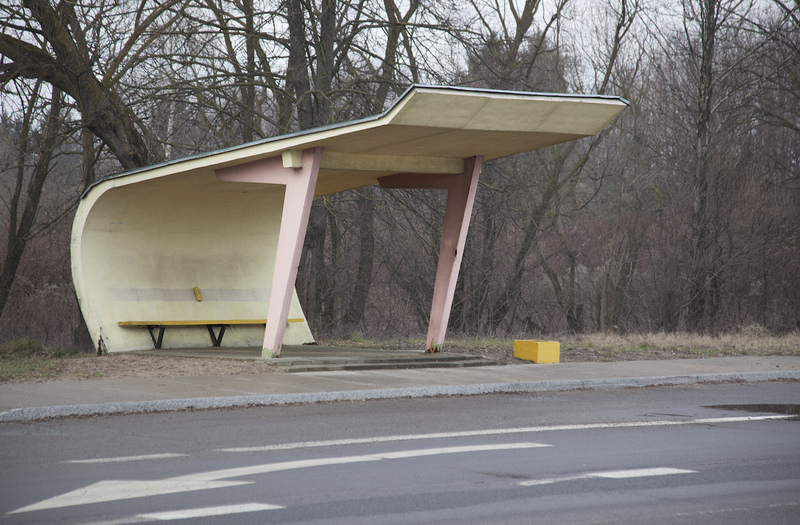 Soviet Bus Stops is, therefore, as much an endeavor to immortalize these gradually disappearing architectural gems as it is a means to showcase the creative voices of individuals who lived in the Soviet Union. He has also seen evidence in many areas of people repainting or trying to recreate murals on old bus stops. In Belarus, local officials in the 1980s actually began commissioning artists to retouch the murals in these old waiting areas, which photographer Alexander Soldatova captured in her series It Must Be Beautiful. Like Herwig’s, her book shows local artists’ attempts to introduce some whimsy to functional structures accessible to and regularly used by all, bringing an unexpected touch of art directly to the people. 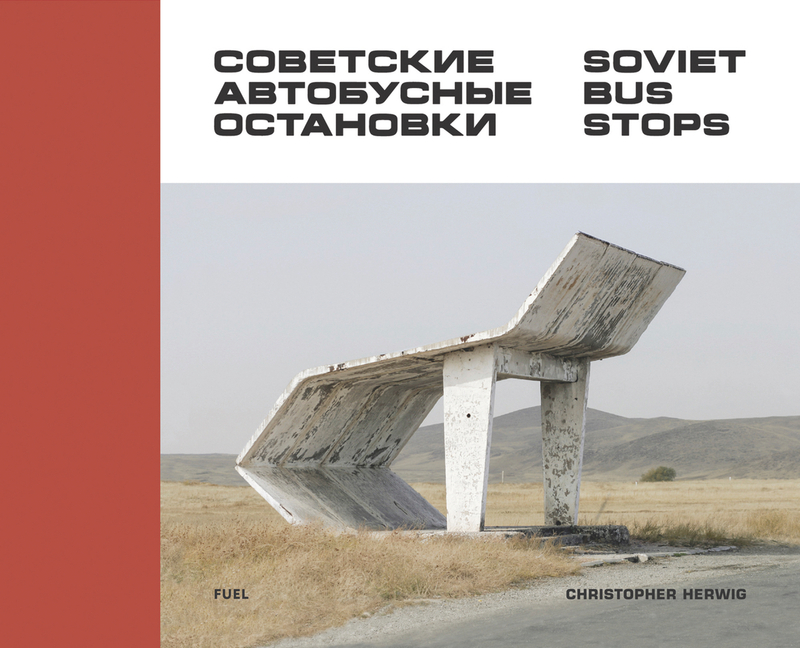 Christopher Herwig’s Soviet Bus Stops will be released on September 29 by Fuel Publishing.